These beautiful houses on spotlight are simply designed by maximizing the area and location. With little creativity and yearning for something different, a new breed of house designs are formed; today, we’ll feature homes with reduced decoration contrasted with extravagant use of geometric shapes, such as squares or circles for structure of the column. There is a variety of design and styles to choose from, a combination of different materials, whether concrete, steel, wood or glass that offers a different character for each home. Today’s ideabook features geometric-shaped houses which are incredibly interesting. With the vast and growing modern home designs, this one is space-saving so as unique. If you like a particular house in this style, try to click on the picture and see its view on different angles. Look carefully and you’ll be mesmerized of how beautiful and creative it is! This one is a popular model. 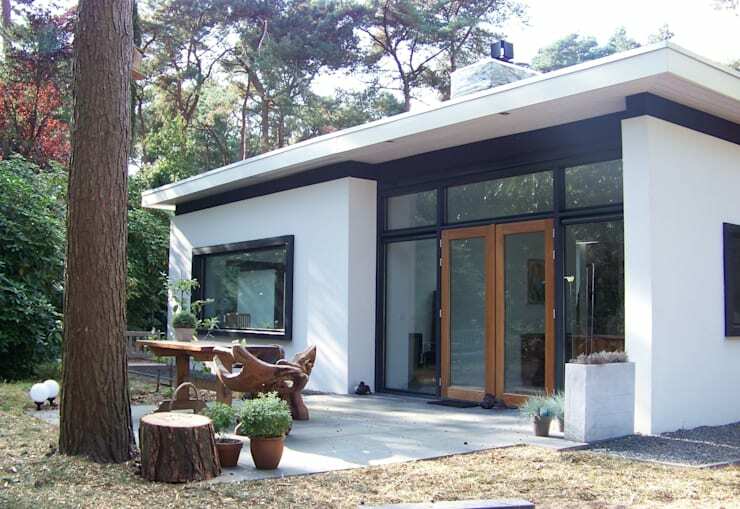 This house has an excellent combination of modern geometric shapes, using concrete and wood. 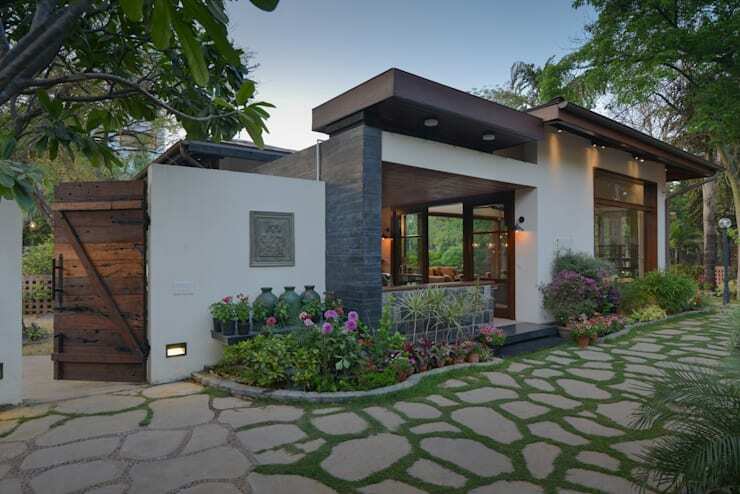 With the house being surrounded by flowers and trees, the hardness of the structure is reduced and thus, look cozy. Also, the natural stone floor which weaves with the leaves and green grass makes the atmosphere lively and quite fresh. A white house with black borders looks pretty in modern style. Black edges on the windows and doors help make the house look elegant and classy. Both windows and doors use clear glass, allowing natural light to penetrate the house thoroughly. To increase variety while still having harmony, terraces, few borders and benches made of natural wood are also added. 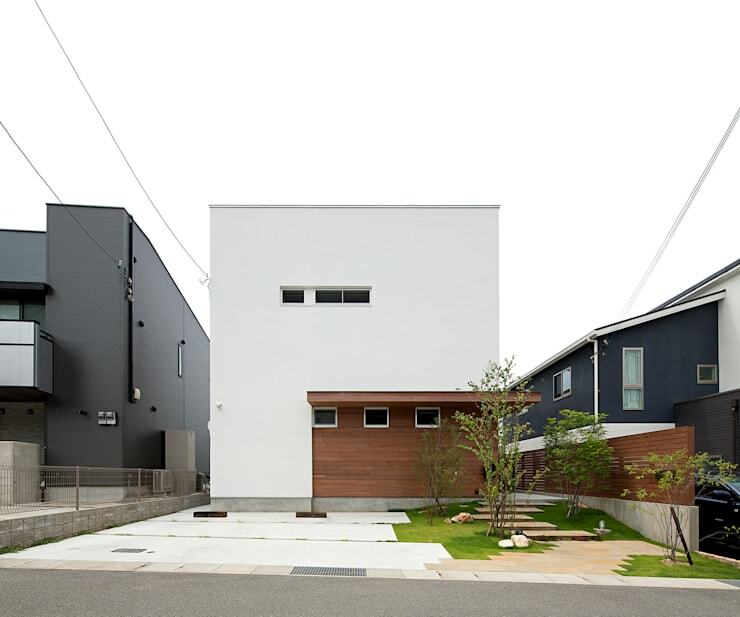 This modern house which paints a picture of a white rectangular box with a smaller wooden box, looks beautiful and distinctive from other homes in the same neighborhood. The addition of brown wood insert at the entrance to the house, gives a warm and friendly feel. The facade of the house was paved from the street forming an illusion; when one looks at it, it’s as if the house is one big modern art piece—a super catch for your IG post! People who works in the creative department or simply loves design work, will surely like this one. The roof gabling upward at a 45-degree angle significantly made the whole house look unique and stylish. This style is a catch especially for twin houses of opposite diameters and varying sizes. The house on the left is the entrance to the house and connects to the house on the right. Pretty odd, and nonetheless fascinating! 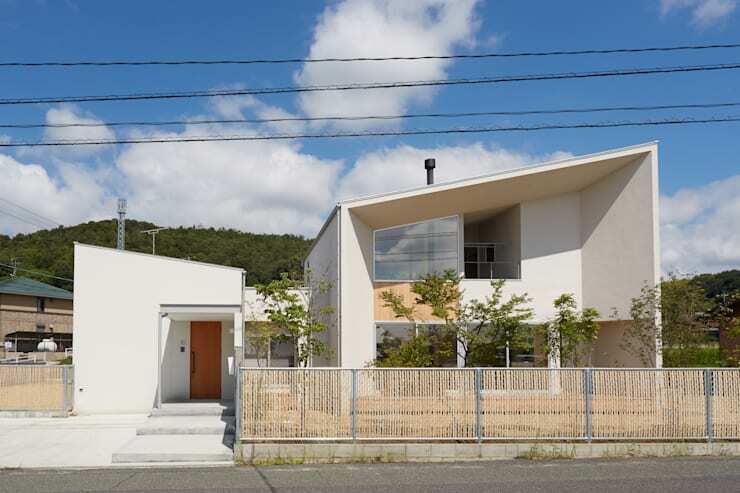 You may be wondering how modern Japanese houses look like? Here you go and take a look. This house keeps that familiar, traditional Japanese home feeling with a little emphasis on the element of wood: a simple and spacious rectangular room with cool white color and wooden furniture and décor. 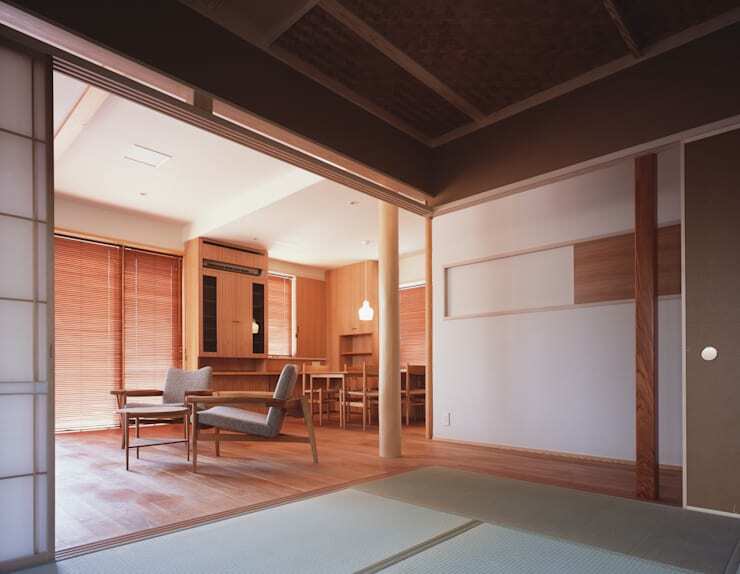 There is also a tatami floor in the living room that gives a natural feel to the home. To sum it up, it still is your characteristic Japanese house, only with a modern twist. Despite its contemporary square structure surrounded by woods, the house is harmonious with nature. The all-white finish of the house blends with the greenery that surrounds it, keeping a simple and stylish view. Large mirrors around the house will complete the look, and even match the location which is forest-like. Rays of sunshine will enter the house in the morning, bask and relax in the presence of nature in the afternoon and see the beauty of the stars at night.